One of the most useful sets of open source FX plugins for Quartz Composer are the v002 collection maintained by Vade and Bangnoise, which are now included as an optional separate package along with VDMX. Included are the v002 optimized fast blurs, “film” image filters, analog / digital glitch, and the Rutt-Etra analog video synthesizer emulator, along with QC based FX ready to use in VDMX or your own QC compositions. To use the add on plugins with VDMX or Quartz Composer, first run the installer included on the VDMX disk image (dmg). Once installed, the add on QC based FX will appear in the v002 category in the filter picker for Layer FX Chains where they can be applied to any source or layer group within VDMX. 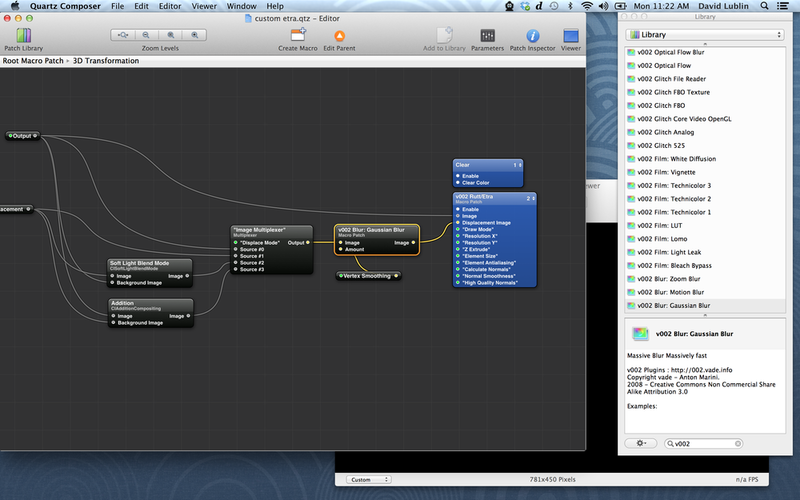 Likewise, the plugins the FX are based on are available in the Quartz Composer Editor for use in your own compositions. The v002 installer can be found on the VDMX disk image. Adding a v002 FX to a VDMX layer. Use the v002 Quartz Composer plugins in your own compositions.